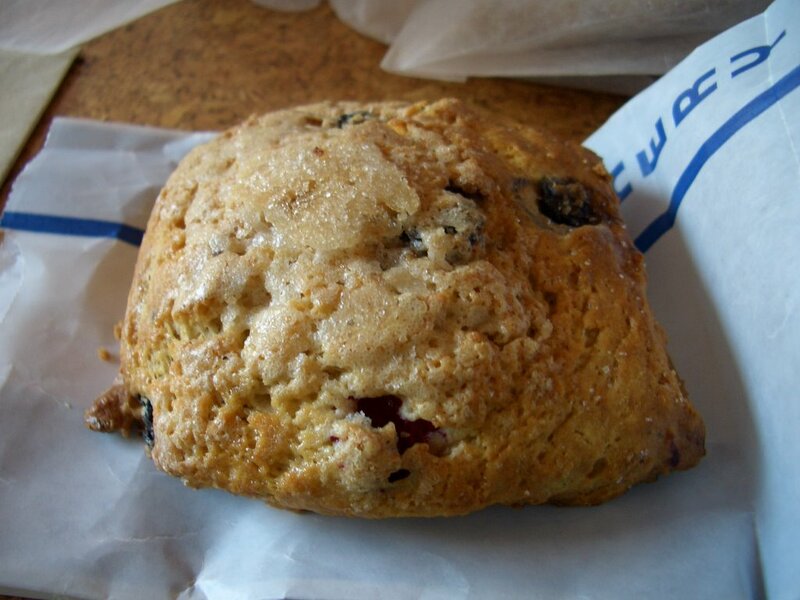 Note: I have since revisited The City Bakery Los Angeles. 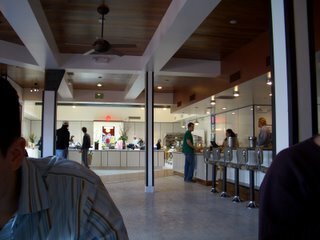 I have so many thoughts about The City Bakery Los Angeles that I'll have to start out with the most important aspects and ramble on and on until perhaps I am the only person still here. 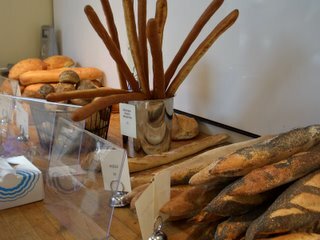 BUT if you're still with me by the end of the post, then add The City Bakery to Wild Flour Bread as a place that is worth-jumping-on-a-plane-for.... New York or Los Angeles (your choice!). So, pastries first. Maury Rubin opened The City Bakery in NYC in 1990, and he is especially known for tarts and pastries-- having even authored The Book of Tarts. 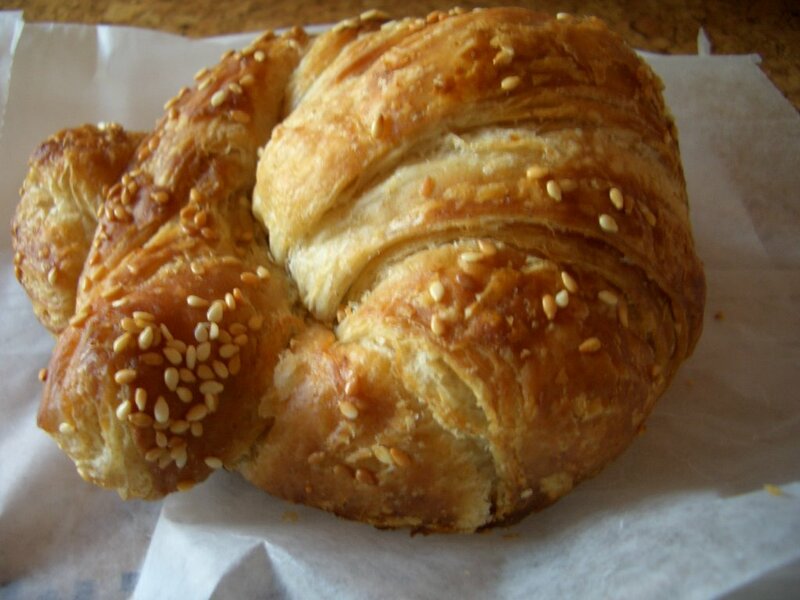 The Pretzel Croissant epitomizes the City Bakery ethos -- considering a classic (French) form and organically innovating it into a new (American) sensation. The croissant dough is salted (perhaps through salted butter?) and sprinkled with sesame seeds, and it is finished by crossing the ends of the croissant, which simply integrates pretzel engineering. It's also partially whole wheat, so it turns out flaky but still a bit squishy. A perfect balance of croissant and pretzel. It works, too, that there aren't big salt crystals on the outside--it would ruin the chew--so I consider the sesame seeds a masterstroke. If it hadn't been so bright in Brentwood, this Melted Chocolate Chip Cookie would be its actual lusciously deep chocolate color. Akin to a brownie cookie, it's a galaxy of ganache-like chocolate interspersed with chunks of chocolate and some undissolved sugar crystals for extra texture. The outside is just firm enough to contain the gooey goodness inside... but in my attempt to my break off a piece of the center, my fingers only emerged coated in fudgy chocolate. Spectacular. When I ate the leftovers later in the day, though, the cookie had solidified a bit. 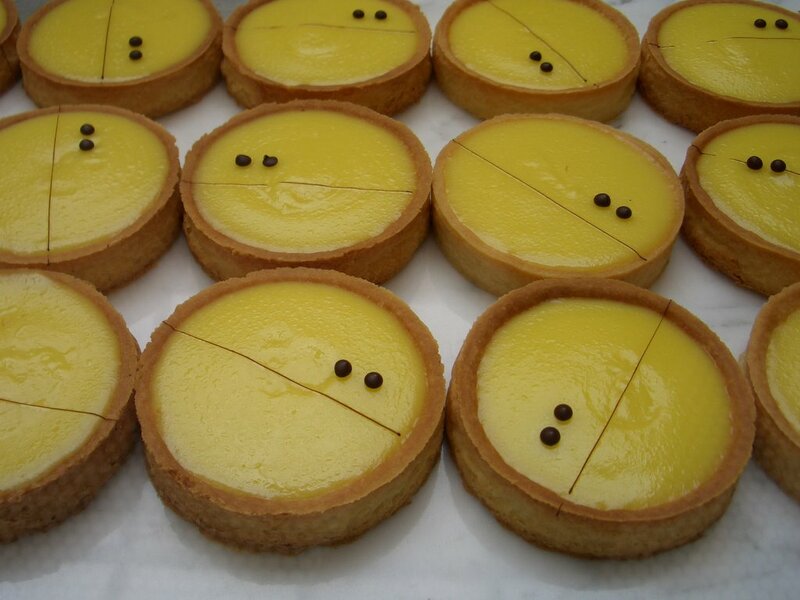 Lemon Tarts. Perfectly puckery with a softening sweetness, and creamy besides. The only hesitation was eating the Pacman-ish face on these. We overcame that. These were the only tarts on offer, but I'm hoping that their other tarts, such as milky way, blueberry coconut, cranberry-almond-caramel, and MANY MORE find their way to LA soon. They are all made in round flan rings, with minimalist--though organically creative--designs. 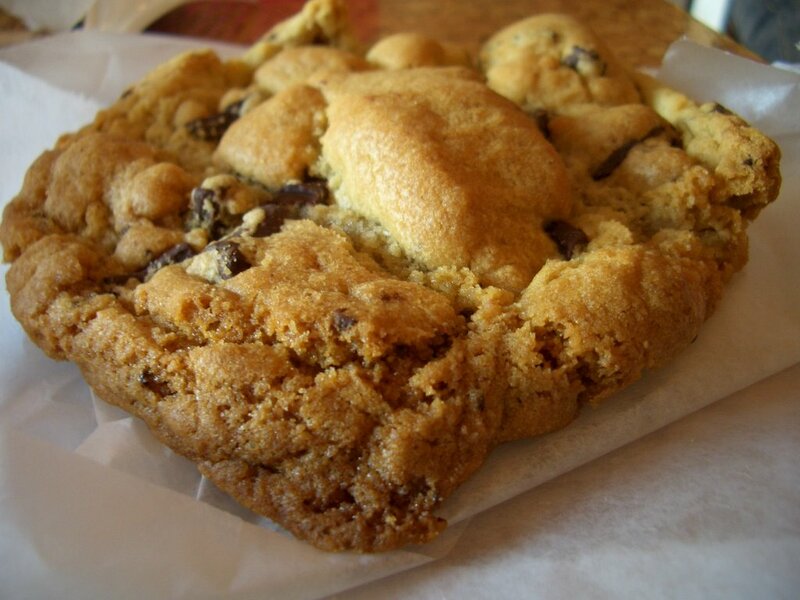 Their chocolate chip cookie... well... rules. 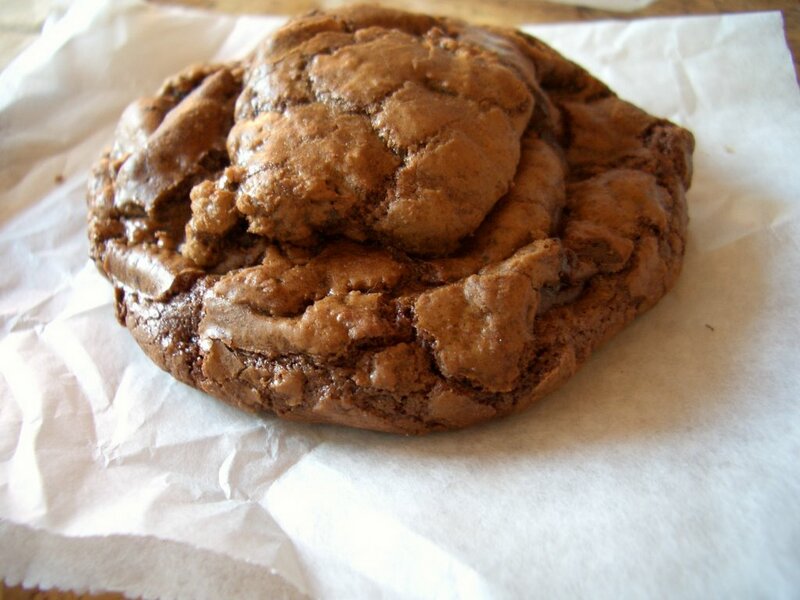 Chewy, flavorful, great chocolate, great dough (it also has slightly discernible sugar crystals when you chew). This cookie was more on the bready side, as opposed to the sugar-y/butter-y side that their East Coast cookies have had. This could be a factor of: choice, the air (temp or humidity), the quirks of the maker of the batch, or the flour (which are often regionally different). The batter is available in some stores as Maury's Cookie Dough to bake at home. 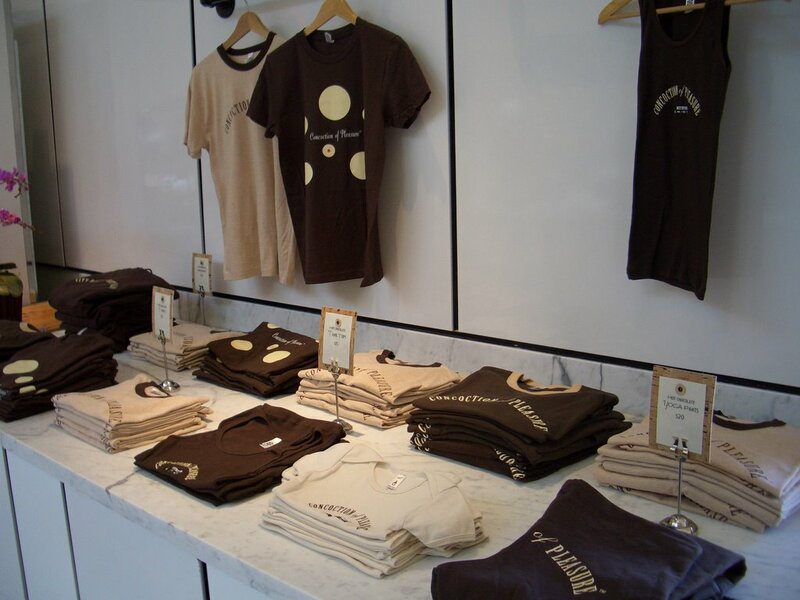 I hope that their white chocolate chocolate cookie turns up in the LA store, because I liked that one best in NY. For fun, I also tried a berry scone and a miso morning glory muffin (with carrots). They check out. And yes, you will taste the soy in that muffin. Coincidentally, the muffins have a wide flat bottom that reminds me of the flan rings shapes used for the tarts. We did eat lunch first, and we both went for the trademark salad bar, which ends up something like this. 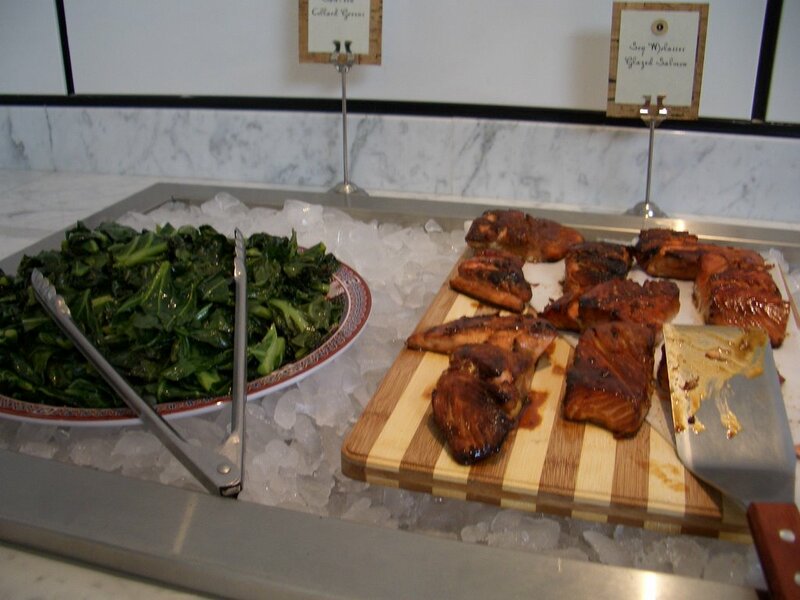 We piled up cornmeal-crusted catfish, roasted fennel, beets with mint, spinach/asian pear/black sesame salad, soy molasses salmon, radicchio/chickpea salad, spicy thai eggplant, roasted brussel sprouts, and breaded chicken with cilantro sauce. The sweet, tender catfish and the roasted fennel stood out as especially delicious while the thai eggplant stood out as being really slimy. 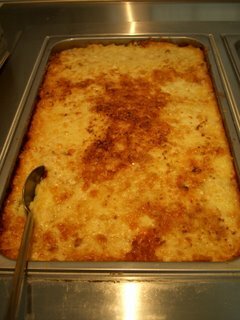 We also got a side of sharp and creamy macaroni and cheese. It tastes like a mix of cheddar, asiago, and fontina to me, but could just be a really great cheddar. I got the lovely puce prickly pear lemonade, and Chad got the regular lemonade. Sigh.... that mac & cheese in its full glory. 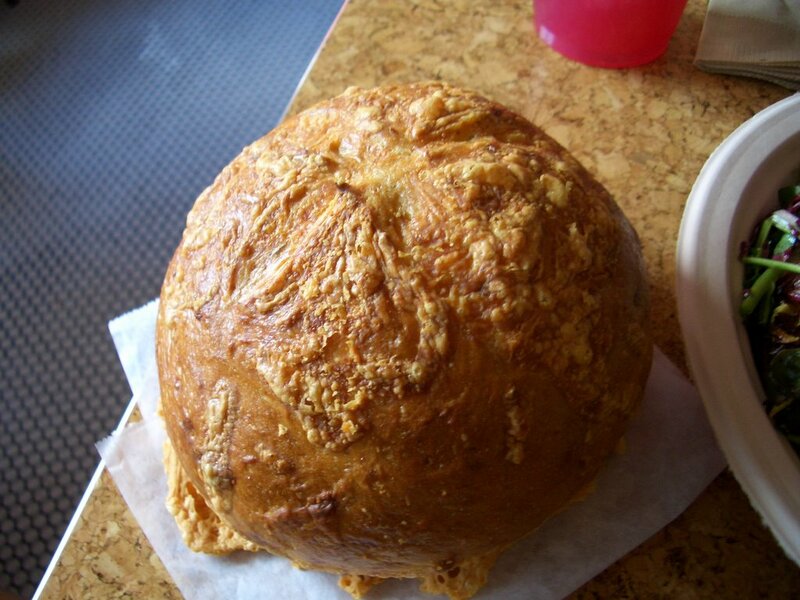 We also got a chili cheddar boule. I liked the cheese feet created by the melted cheese off the bottom sides. It was fantastic with the Turkey White Bean Chili that we made at home that night. And so went our meal. 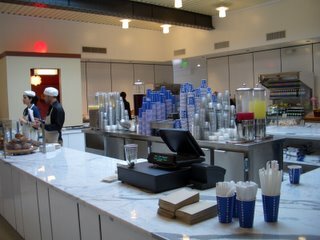 There was also a lunch counter where you could get pressed sandwiches, egg scrambles, sandwiches, and the like. It was mostly savory, but I especially wanted to try the date and walnut w/ fresh ricotta pressed sandwich and the guava and cream cheese sandwich. 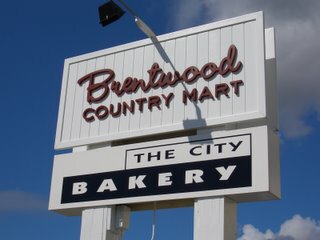 I've never been the type to rush to a new restaurant when it opens, but I think that the City Bakery in Brentwood shows its youth right now. It's only been open for about two weeks. 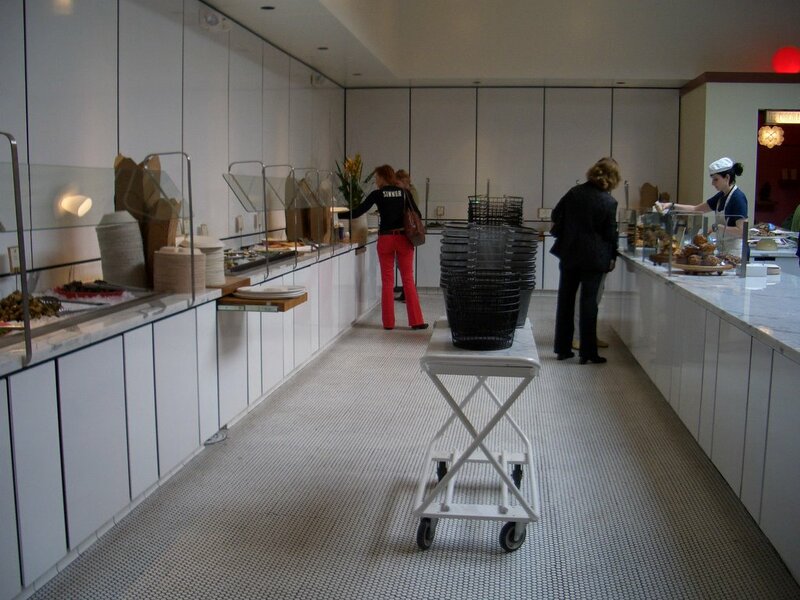 The pastry counter and salad bar were a bit bare -- it was about 1:00 when we left and a lot of NY stalwarts weren't out there--no peanut butter cookies, no homemade marshmallows, no marinated tofu w/ chili sauce, only one type of tart. Certainly, there was plenty to binge on, but not so much in comparison to NY. That reminds me. They DID have the amazing trademark hot chocolate on offer. I just knew I couldn't fit that rich and creamy molten chocolate into me that day. They are supposed to have a cold hot chocolate soon. 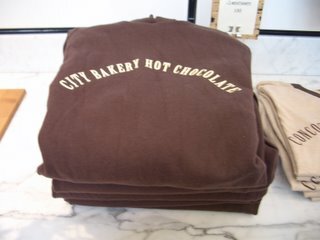 I can also only hope that The City Bakery Hot Chocolate Festival makes its way to LA, too. There was also an extensive catering menu available (is that in NY, too? ), divided into breakfast, lunch, afternoon snack, midnight snack, and cocktail party. This is a good time to talk about price. As I understand it, The City Bakery is organic. 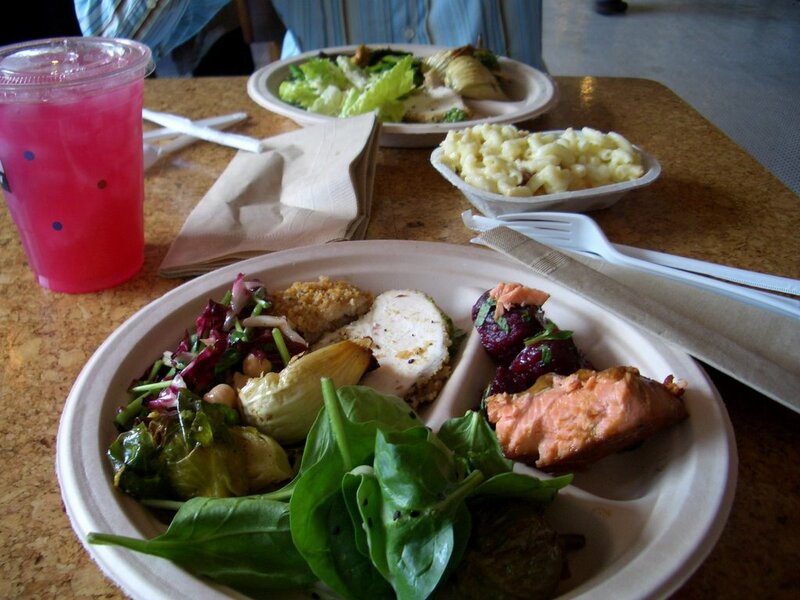 So, that salad bar above will run you $16/lb. Cookies and muffins are $3/ea. 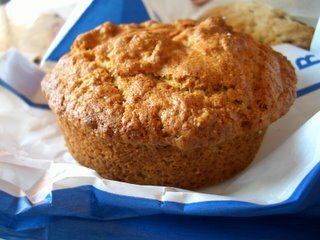 For catering, for example, a "breakfast box" of mini muffins, seasonal fruit & fresh squeezed OJ runs $15/person; a half tray of mac & cheese is $40; cornbread with aged cheddar, peach jam, & jalapeno butter is $10/person; and chicken wings are $36/dozen. I like that the $10/person "Assembly-Required Hot Dogs" includes a comic book, among many other things. I believe that it's worth it, but for me, that would mean enjoying its worth every five years or so... or seeking out an expense account. As for the salad bar, at least spinach leaves are light. 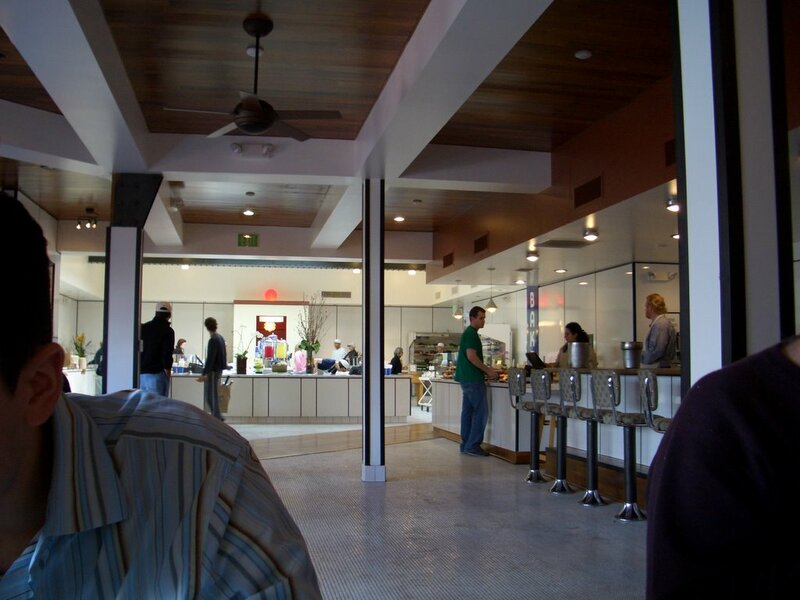 I'll be traveling to LA a bit this year, and I'm looking forward to seeing how the City Bakery LA evolves. The quality is definitely there, in swoon-worthy proportion, but I wonder which products will find their way to its counters. I was expecting to see Maury Rubin's take on Los Angeles and its foods, but right now, it very much feels like an LA branch of a NY institution (having only its classic pastries for sale, bagels on offer, references to Manhattan on its catering menu). Of course, it is also winter, so there is time to amp up for spring and summer produce. Rubin, after all, follows a "Chez Panissian" (aka Alice Waters, aka started in California) approach of local foods and seasonal menus, so I expect interesting things to come. One thing that did feel Californian was its interior design. Unlike the rather industrial silver permeating the NY branch, the one in the Brentwood Country Mart is white, and quite bright--even if it did retain a minimalist core. 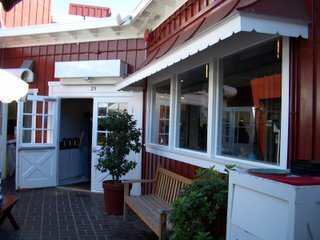 It's extremely roomy, especially with only 10 tables and 6 counter chairs for eating, but there is ample outdoor seating at wooden tables w/ umbrellas and lots of room to wander around the shop. And what did I cunningly manage to include in all these photos? 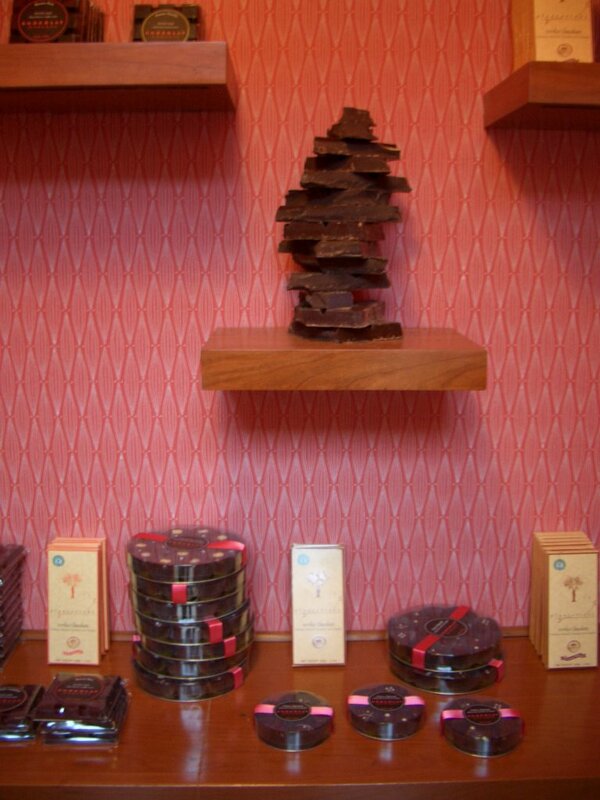 Yes, there is a Chocolate Room LA. Thank you for All of those photos! I can't wait to go myself. Your post is my new incentive to finally get down there. Hopeyou can get there soon! I'm going ot check in again on it next weekend when I'm down in LA. Julie - Thank you so much! 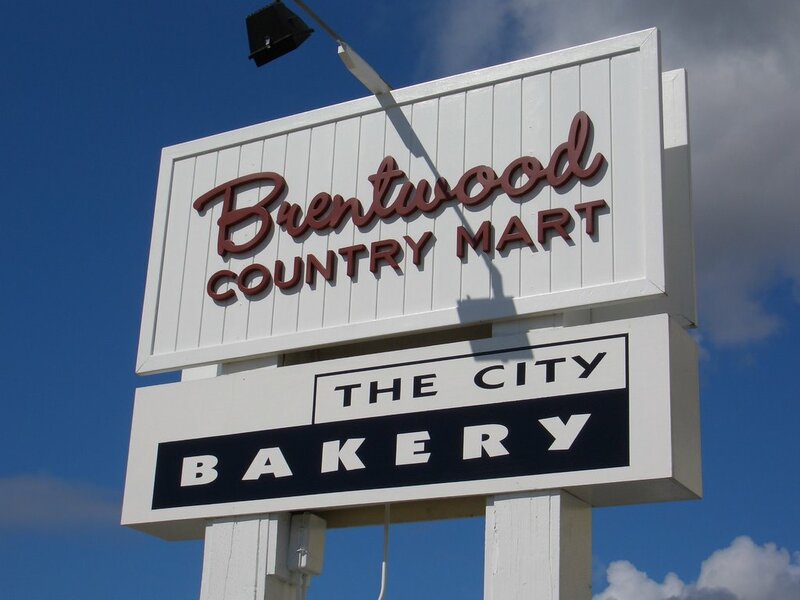 I hope that you'll enjoy the City Bakery as much as I do. :) I miss the NY one so much! I went back to the LA one again a couple weeks ago (and am still getting around to blogging about it), but I tried a new pastry called a Caramelized French Toast, which is basically a portable piece of fantastic French toast. If you can get that, it's amazing!